Ustream is a great free live casting service. Anybody can become a broadcaster. However it's always hard to reach out to the audience. If you can show visitors that you are live on Ustream, it could increase your viewership. So I made this simple add-on using Ustream API call. The source code was tuned by Yamanoi. This is a free add-on with not so much of the support. If you would like to see more functionality, please drop a line. I will consider making them. When you use this add-on, I highly recommend to ENABLE FULL PAGE CACHE!!! 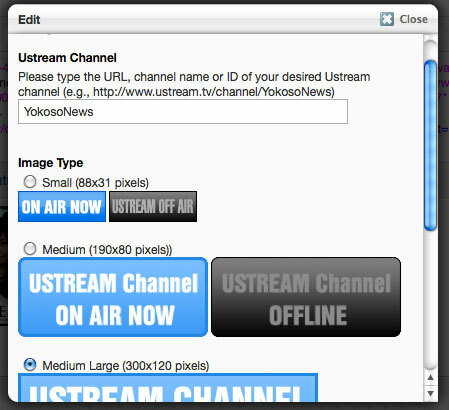 Or Ustream may block the status check from your website. Select the image type and/or add your own images from file manager. This is very basic add-on. If you understand concrete5's custom templates, and HTML, you can change the image easily. Also check my other addon, "Twitcasting Live Status" It does the same thing for Twitcasting.